AMN Healthcare (NYSE: AMN) reported Q2 2018 nurse and allied volume grew 4% over prior year, excluding strike staffing. Volume growth was experienced in both the travel nurse and travel allied businesses, offset by double-digit declines in per diem nursing. New travel nurse orders trended flat with prior year levels, driven by existing staff at hospitals working more overtime hours and increased permanent clinician hires. Despite robust Q2 2018 travel allied revenue growth of 16% over prior year, Cross Country Healthcare (NASDAQ: CCRN) reported organic volume declines in its travel nurse business. In the first half of 2018, CCRN experienced a decline of $30 million in gross spend under management across its top five MSP clients. Among medium-sized MSPs, there was a mix of growth and declines. Overall, the pull back in client demand was driven by cost savings initiatives, more overtime worked by permanent staff, and a continued shift in patient care to non-acute settings. AMN also commented on the impact of more overtime hours worked. “The overtime and extra hours worked are not particularly sustainable. Most nurses complain about burnout and working too many hours. And if they are being pushed or forced to pick up extra hours and shifts, that is likely to translate into even higher attrition, even though we’re already at historical highs and frustration by their nurses,” said Susan Salka, CEO of AMN Healthcare, during the company’s Q2 earnings call. 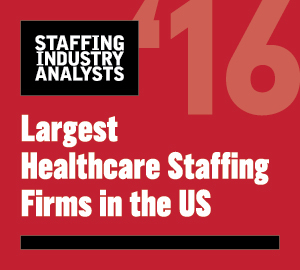 According to previous healthcare industry studies, attrition can be costly at more than $60,000 per nurse. Temporary staffing can be cost-effective in alleviating high usage of overtime, as noted in a recent U.S. Hospital Nursing Labor Costs Study, which found that the hourly, all-in cost for a full-time permanent nurse including overtime pay exceeds the average hourly cost for a travel nurse. Despite the subdued demand trends in nurse staffing, AMN remained bullish about its long-term growth potential and continued momentum of MSP wins, representing $113 million in gross spend during the first half of 2018. Across its top 20 MSP clients, 16 had year-over-year net revenue growth in Q2. AMN projects modest year-over-year growth in Q3 travel nurse volumes, driven mainly by its MSP client base. Over time, the company believes it can increase its MSP direct fill rates of 70% by another 5 percentage points. Overall, CCRN remained optimistic about Q4 and 2019 based on its projected full-year 2018 MSP contract wins representing $70 million in gross spend, continued expansion into non-acute facilities, and anticipated growth in the travel allied, advance practice, education, and search businesses.